The government of Sierra Leone has recently announced plans to offer bonds to foreign companies for the first time. The government will be issuing bonds worth 60 million Leones ($14m) maturing in 2016 and consider selling further three-year bonds. As Bloomberg explains, its objective in doing this is to rebuild much of its power infrastructure which was destroyed during its civil war. Sierra Leone is currently trying to contain the worst Ebola outbreak ever, along with Liberia and Guinea. 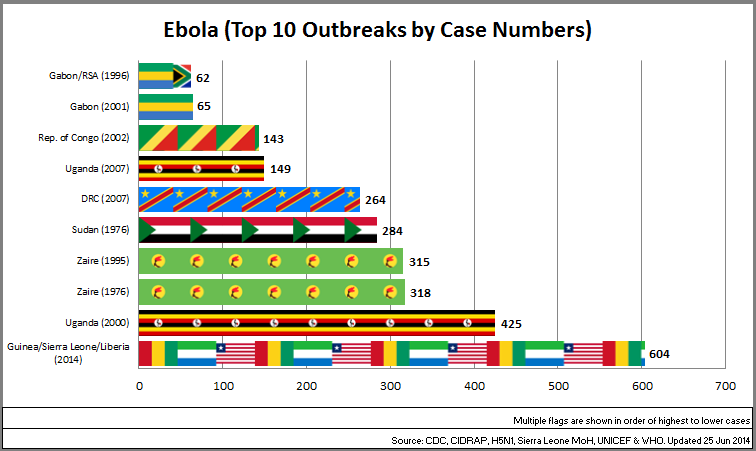 As this graphic shows, the number of cases in this West African Ebola outbreak is greater than ever recorded in any previous outbreak of the disease. In this context, the importance of a sustained post-civil-war recovery and improvements in national infrastructure are clearly paramount. Sierra Leone's current power deficit is about 200 megawatts, more than twice its total power output at present (94 megawatts). The other imperative in issuing two and three-year bonds to international investors is to reduce the pressure currently on the short-term instruments that the government uses to raise money domestically, moving three and six month bonds to longer-term instruments. If restructuring their debt and issuing new bonds in this way can raise the money required for infrastructure development, then that will be very welcome.